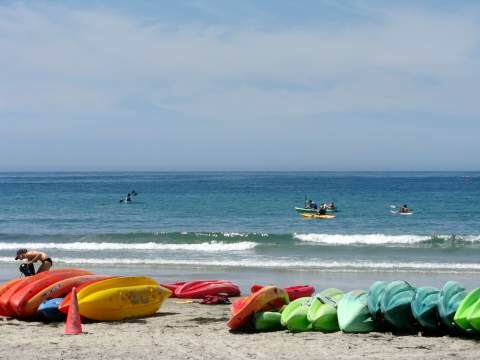 La Jolla Kayaking is one of the best adventures in San Diego, California. My kids and I absolutely loved it! Take a tour or rent a kayak to see the spectacular La Jolla Sea Caves, located near La Jolla Shores beach. You can go on a kayaking tour, rent a kayak for a few hours, or bring your own kayak. There is a small boat launch at the south end of La Jolla Shores beach. The waters between La Jolla Shores and La Jolla Cove are beautiful, full of leopard sharks (harmless), Garibaldi (California State Fish), and the many seals who hang out around the La Jolla Caves and Children's Pool. These waters are part of the La Jolla Underwater Park, a protected marine reserve. Kayaking La Jolla Shores is very popular, especially to kayak the La Jolla Sea Caves. Several companies offer kayak tours and rentals for single and double kayaks, or you can bring your own. Reservations for kayaking tours are required, and should be made early during summer season, as these will sell out. Early morning tours are usually not as crowded, and I recommend going at high tide to be sure you can enter the caves. San Diego Bike and Kayak - 858-454-1010, 2158 Avenida de la Playa at La Jolla Shores. The original kayakying company in La Jolla, they offer kayaking, snorkeling and bicycling adventures. San Diego tourists should consider the San Diego Go Card, a great way to get vacation deals. For more information, see Go San Diego Card: 3, 5 and 7 day cards! La Jolla Sea Cave Kayaks - 858-454-0111, 2164 Avenida de la Playa at La Jolla Shores. La Jolla Kayaking at La Jolla Shores Directions – from Interstate 5 go west on La Jolla Village Drive, left on Torrey Pines Road, right on La Jolla Shores Drive, then left on Avenida De La Playa. 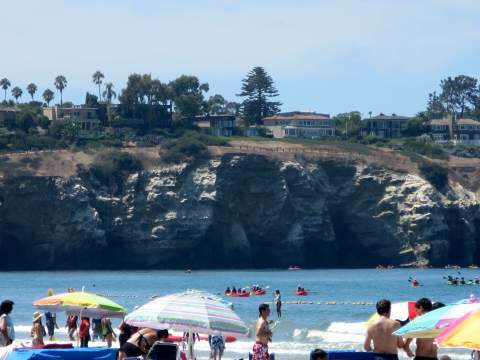 The La Jolla kayak tour and rental shops are located here. To park, go right on Camino Del Oro two blocks to Kellogg Park, or search for street parking.